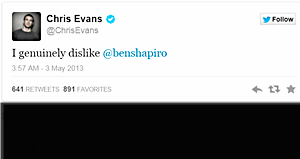 Brietbart.com senior editor Little Ben Shapiro (who looks and acts like he should be sorted into Slytherin at Hogwarts) doubled down on his homophobia this week much to the chagrin of Captain America himself studly actor Chris Evans whose brother is gay. Shapiro who wrote a column earlier this week saying that there aren’t enough killings and hate crimes against LGBT’s to warrant protections because Jews have it a lot worse then took to the Twitter to bash Jason Collins the NBA center who recently came out of the closet . Shapiro then went on the Piers Morgan Show to explain himself and Morgan took the whiney and extremely effeminate Shapiro to task for his homophobia to which Shapiro accused Morgan and Collins of hating America by thinking that it’s all homophobic not just a minority of evil idiots like Shapiro. But the most disgusting thing about Shapiro is that he makes these comments at the expense of the gay community so as a Jewish man he be accepted by the largely anti-Semitic GOP. the Party of Jeebus freaks by regurgitating the GOP’s intellectually dishonest talking points against gay people, so he buys himself one more day tolerance from them and earn his weekly paycheck of blood money. Will, while your overall point is solid, I really don’t understand why you’d resort to describing Shapiro as “extremely effeminate.” What does that even mean? Is there something wrong with effeminacy that you’d choose to use it in a way clearly meant as pejorative (e.g., by pairing it with “whiney”)? What bearing does his alleged effeminacy have on his argument? Would it make his argument any less offensive if his bearing were — to your eye — less effeminate? Of course not. So it’s a word that adds nothing to the description, but that in contexts like this frequently comes off instead sounding misogynistic and/or as internalized homophobia. “Misogynistic and/or as internalized homophobia?” Me? Actually it was used to state that he might have his own issues with homosexuality that might be more internalized and undercover. Maybe the snark was a tad too over the top though. Thanks for the imput.